This recipe couldn’t be more simple. If you are feeling adventurous, you could make your own Kung Pao sauce, but the Panda Express bottle that I used was delicious. It did have a little kick, but my kids still ate it! Spray crock pot with non-stick cooking spray and place chicken inside. Pour bottle of Kung Pao sauce on top and cook on low for 5-6 hours or high 3-4 hours. For the last 30 minutes of cooking*, turn the slow cooker to high (if it isn't on high already) and add diced bell peppers, water chestnuts, and peanuts. After finished cooking, remove chicken breasts and cut into bite-sized pieces. 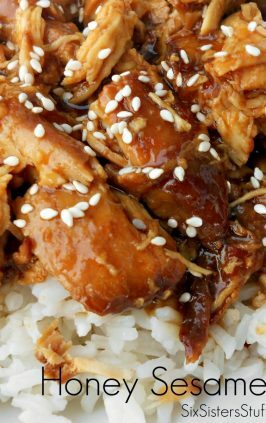 Return chicken to slow cooker and stir until chicken is completely covered in sauce. 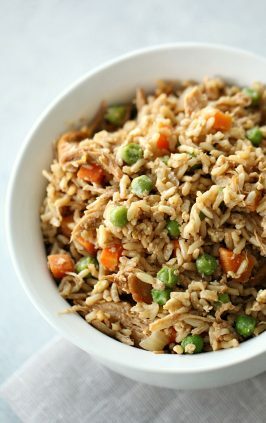 Serve over white or brown rice. If you would like to make this as a freezer meal, place all the ingredients (you can choose to add the peppers at this time or wait until right before serving) together in a resealable Ziploc gallon-sized freezer bag. Seal the bag and place in the freezer until you are ready to use. About 24 hours before serving, remove bag from freezer and let thaw in the fridge. Spray slow cooker with non-stick cooking spray and then add contents of bag. Cook on low for 5-6 hours or high for 3-4 hours. 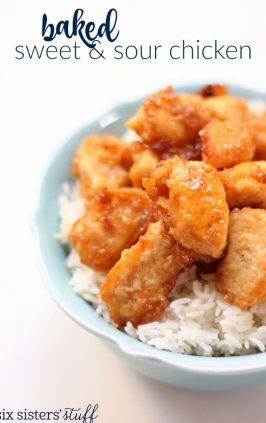 Remove chicken and cut into bite-sized pieces, add chicken back to sauce in slow cooker and mix well. Serve over rice. *You can add the peppers in at the beginning and let them cook all day, but they tend to get pretty soggy. I prefer the peppers to be tender but still have a little crunch to them, which is why I add them at the end. How exciting! I am looking forward to the clothing items! Camille, I LOVE your crockpot recipes! They are always so good! Keep up the great work! Carly, thank you SO much. I really appreciate your kind words!! Have a wonderful day! Thank you for the nice recipe and congrats. Do you add the green onions to the slow cooker when you add the peppers or do you just put them on top when it's done? We added the green onions at the end as a garnish! Made this for dinner last night and it came out great. I left my chicken breasts whole when serving and used half a white onion instead of green onions and no peanuts. Cooked mine on high for 3hrs. Family loved it!! 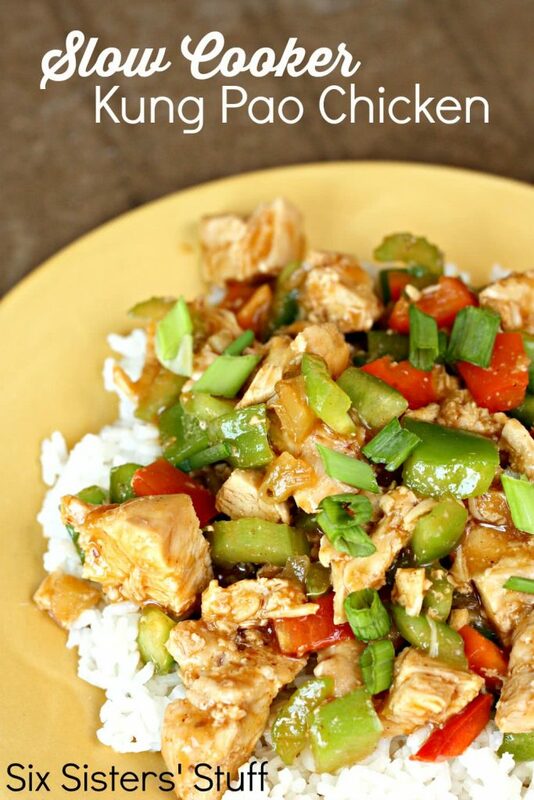 I love Kung Pao Chicken and can't wait to try this! I would like to try adding zucchini to it as well. Do you think I would just add at the same time as the peppers? I am hoping it is not too spicy for my kids, who don't like anything spicy. 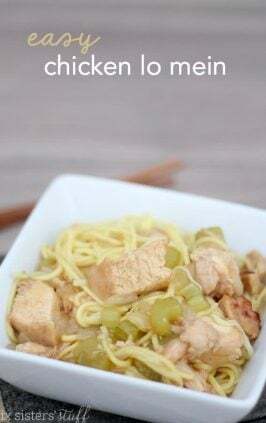 I made this recipe a few weeks ago and loved it!! However, it's a little spicier than the rest of my family likes. Do you have any suggestions as far as different sauces I could use instead to make it a tad less spicy? Thanks!! What are your suggestions for making this a freezer friendly meal? Would you put it in the crock pot frozen... or defrosted? And all together, even tho the peppers get soggy? 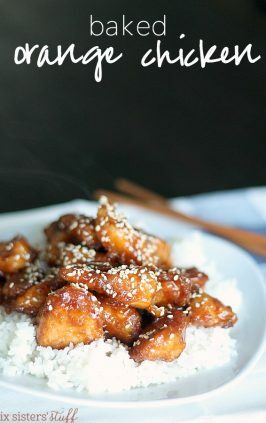 Looks yummy and I want to make this for my upcoming freezer meal swap! I would defrost slightly before sticking in the crock pot as a freezer meal. I would mix it all together. I made this for the first time last week - and then I made it again because it was so yummy! My chicken certainly didn't end up looking quite so nice and cubed; it was definitely more of a pulled chicken consistency. I added the green onions in with the bell peppers and peanuts, and I omitted the water chestnuts. It turned out sooo good! It was quite spicy, but my husband and I love when our food has some kick. This is definitely getting added into our meal rotation! P.S. It may say that the peanuts are optional, but you should include them! They really add an amazing texture to the dish, and it really wouldn't be as good without them. Is this spicy? I want to make it for my family and we have a 20 month old. thanks! The Kung Pao sauce had a little kick to it, but our kids still ate it. We used Panda Express brand, you could try another brand. Why would want to feed this to a BABY?! She said 20 month old not 5 lol. The baby is almost 2 years old. I thought this might not be great because of using a bottled sauce. It was delicious though and had a lot of flavor. This recipe goes together fast and is perfect. Everyone in our family ate it including the two picky boys. 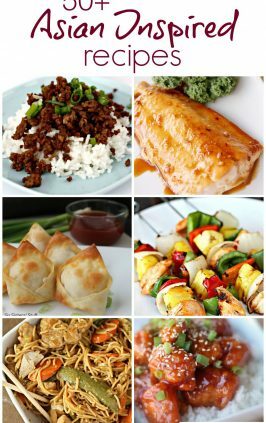 Is there a recommended recipe for making your own kung pao sauce? We always buy our Kung Pao Sauce. You can find recipes for it on the internet, but you need so many ingredients that we found it was easier to just buy it already made. Do you cook it all before freezing or freeze the chicken raw ? For a freezer meal, you make the recipe and then place it in a good freezer bag. Pull it out and thaw and then cook in the slow cooker. So easy!